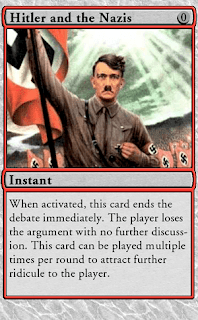 If you have been in an argument on the internet you've almost certainly encountered the Hitler Card (or Nazi Card or reductio ad Hitlerum). There's even Godwin's Law which states "As an online discussion grows longer, the probability of a comparison involving Nazism or Hitler approaches 1." Person 1: We should do X. Person 2: You know who else wanted to do X? The Nazis/Hitler! And the argument is effectively over, not because anyone won, but because everyone lost. I was watching Ken Burns' documentary The National Parks recently and I came across, what might be the very first instance of the Hitler Card being played. I had to pause the show and research for a bit. Sure enough, it was a straight-up Hitler comparison in an argument about national parks. Here's the short version: Wyoming politicians didn't want to give up land around Jackson Hole to an expanded Grand Teton national park. The president wanted to preserve the land and so used the Antiquities Act to name the land (much of it donated) as a national monument. Locals were upset because they wanted to use the land for grazing and other commercial enterprises. A part of the opposition was an opinion piece written by journalist Westbrook Pegler (who had opposed many of the president's policies). That's right. The first Hitler Card was played while Hitler was still in power, while the US was at war with Germany, and it was played against President Franklin Roosevelt. Look on a map today. There is no Jackson Hole National Monument. It doesn't exist anymore. During the height of the protest a local Jackson Hole resident, who would later represent Wyoming in the US Senate and then become governor of the state, Clifford Hansen, joined a group of men that led an illegal cattle drive across the national monument land. Congress passed a bill abolishing Jackson Hole National Monument. The president vetoed it. Wyoming sued and appealed to the Supreme Court. They refused to get involved. It took until 1950 for tensions to settle and for a compromise to be worked out. Now, there is no Jackson Hole National Monument because all of that land has been folded into Grand Teton National Park. In his interview on The National Parks, Hansen apologized for his opposition to the park and said that he's glad he lost. In his opinion, the Grand Tetons are a Wyoming treasure. It often feels like we'll never get anything done. It often feels like everyone is dropping the Hitler Card to avoid dialogue and prevent change. It has been that way since Hitler was alive and leading the Nazi Party. Progress isn't driven by obstructionists. Progress is driven by people who care, who believe, and who consistently work over time, despite being called a Nazi or compared to Hitler, to make things better. The short term feels apocalyptic. The short term feels stuck. The short term feels like nothing good will ever happen. But we don't live in the short term. We are people whose lives span decades, we are a nation that spans centuries. We have seen obstruction. We have seen panic. We have seen arguments derailed time and again. But together we've moved forward. Clifford Hansen was one of the most vocal opponents to the expansion of Grand Teton National Park. If Twitter had existed, he likely would have retweeted Westbrook Pegler's article comparing FDR to Hitler. But at the end of his life Hansen was a changed man. Not because the Hitler Card worked, but because it didn't. It was a short-term distraction technique, but the people working for a national park weren't distracted, they weren't dissuaded, they weren't defeated by harsh, empty words. Change isn't driven by words alone, it's driven by consistency and action over time. Neither will change be stopped by people spouting harsh, empty words. Don't be distracted, don't be dissuaded, change is not so easily defeated. Keep working, keep taking action, keep making the world around you a better place. If you do, you'll probably be compared to Hitler, just like Franklin Delano Roosevelt was.